How long does it take to do a circuit of the Kushiro Wetlands? If departing from Kushiro Station, travel times alone will take about 2.5 to 3 hours (about 92 km). Including time for sightseeing at each observatory and enjoying activities, please budget a half day or more. Where can I view tancho cranes?? Kushiro is the only place in Hokkaido where you can view tancho cranes up close. The cranes that live here are called tancho, a native species only found in Japan. This species was once endangered, but its population has increased thanks to the conservation efforts of local residents. Can I see tancho cranes at any time? Yes. The tancho cranes raised at the Tancho Crane Nature Park facility can be observed year round. Wild tancho cranes reside in the wetlands year round, but they are particularly cautious when they raise their young in summer, so are rarely seen. (You might have better chances to see them on a guided tour...) In winter, as part of conservation efforts, feeding is carried out, so you can observe many tancho cranes gathered about the several feeding points. Do any of the hot springs accept day visitors? A variety of facilities, including hotels and public bathhouses, offer day bathing. Click here for a list of facilities with day bathing. Please let me know about barrier-free facilities. When is the cherry blossom season? Mid to late May is the best time to view cherry blossoms. When is the best time to view autumn leaves? Where can we see them? In most years, the best time is late September to early October. The entire Kushiro Wetlands will turn gold, so observatories and wooden promenades are a wonderful way to take in the scenery! You can also see beautiful autumn leaves along the Lake Akan. When are the foggiest seasons? According to data, there tend to be particularly many foggy days in July to August. What are the airline in-service rates due to fog? Is there a rainy season? Inclement weather such as the rainy seasons ("tsuyu") or typhoons you might experience in Honshu are extremely rare. However, there is a particular Hokkaido rainy season known as "Ezo tsuyu", which is characterized by about two weeks of ongoing light rain and cloud. This will often occur after the rainy seasons of Honshu, from late June to early July. Where should I get off the expressway? Where can I get on the expressway? What sort of methods are there to access the wetlands? To access the west side of the Kushiro Wetlands (Kushiro Marsh Observatory, Onnenai Visitor Center), you can use the Akan Bus Tsurui Line. On the other hand, to access the east side of Kushiro Wetlands (Hoso-oka Observatory, Lake Toro), you can use the JR Senmo Line. What sort of methods are there to access the airport? According to departure time of the plane, Kushiro Airport Shuttle, Akan airport liner is operated. Also, public route buses (Akan Bus: Akan Line, Rifure Line) can be used to reach the airport. Other methods such as taxi or rental car may also be used. For details, please see the "Getting to Kushiro" contents. When heading towards Sapporo on the Doto Expressway from Akan IC or Ashoro IC, where is the first service area? How long will it take? The nearest service area is Tokachi Heigen SA. This is about 1.5 hours from Akan IC, or about 1 hour from Ashoro IC. How should I access the wetlands from the airport? There is no public transit that offers direct connections from the airport towards the wetlands. The nearest point from the airport is the Kushiro Marsh Observatory (west side of Kushiro Wetlands). To get here, you can take the Akan Bus Akan Line or Kushiro Station Airport Shuttle Bus to the "Tottori Bunki" bus stop. From there, cross to the other side of the road, and transfer to the Akan Bus Tsurui Line. If time is short, take a taxi to Kushiro Marsh Observatory (about 15 minutes / 17 km by car). On the way back, you can take the Akan Bus Tsurui Line to JR Kushiro Station. 1. Board the bus from the rear door. 2. Next to the entrance door, there is a numbered ticket dispenser. Take one ticket. 3. The fare will be displayed above the driver's seat. Your fare is the amount displayed under the same number as your ticket. *The fare will increase as you travel. 4. 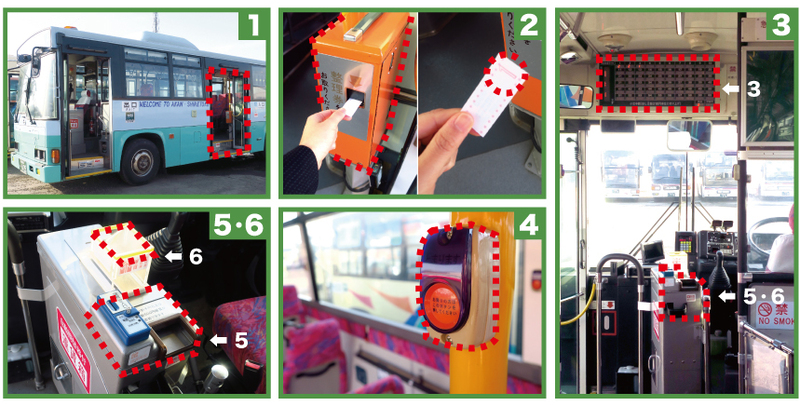 When the bus approaches your stop, press the wall-mounted button to inform the driver. 5. If change is required, use the change machine next to the driver's seat, then pay your fare. 6. When disembarking, place both your ticket and fare into the machine next to the driver's seat. I am interested in mountain hiking. How is the volcanic activity status? We can provide up-to-date information by telephone or e-mail. Or, please use the link below for recent volcanic activity information. Can I see tancho cranes at Lake Akan? Tancho cranes do not inhabit the Lake Akan area. The best time is around early October. A recommended spot to enjoy autumn leaves is the Takimi Bridge, located about 5 km from Lake Akan hot spring district. Can I do a circuit of Lake Akan? Due to nationally-designated special protection zones, it is not possible to walk a complete circuit around Lake Akan. Can I visit a marimo habitat and actually see it? The marimo habitats are within special protection zones, and are not open to the public. Where should I get off the expressway? How can I access Lake Akan from Kushiro Airport? There is a public route bus (Akan Bus Akan Line) which goes to the airport. Alternatively, you may use taxi, rental car, or other options.